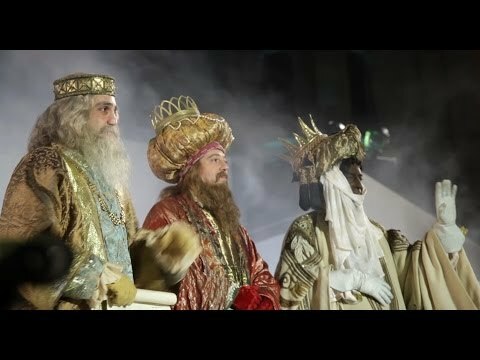 This reading and listening exercise is about the Spanish tradition of the Three Kings - Los Reyes Magos. This is suitable for level B1 Spanish students, though it contains a B2 grammar point. Nowadays Spanish children do receive gifts on Christmas Day, but traditionally there was no exchange of gifts at Christmastime in Spain; children waited till the Epiphany, the 6th of January for their gifts, brought to them not by Father Christmas, but by the Three Kings. Children write to the Three Kings, listing their preferred gifts, knowing that just like Father Christmas, they also know who has been naughty or nice! Naughty children can expect to receive a piece of coal (usually made of sugar though). The school holidays always last from Christmas until after the 6th of January (familiarly known just as Reyes) and all big towns have a parade the night before, where the Three Kings, their helpers and all kinds of other friendly characters arrive and throw sweets to the crowds of children lining the streets. There’s a video below the “bilingual reader” so you can see what happens during the parade (but it’s not part of the exercise – it’s just for information). The bilingual reader article below was written and recorded by Kwiziq's Spanish expert, the amazing Inma Sánchez. Click play to listen to the article. You can read the transcript at the same time or after. Click any phrase for the translation and links to related grammar lessons which you can add to your Kwiziq notebook to practise later.